In February 2015, Lindsay Bonito, a staff researcher, and Nathaniel Hannah-Holloway, a graduate student, in the Sandin Lab at Scripps Institution of Oceanography visited Barbuda to conduct some of first surveys using photomosaic technology in the Caribbean. Barbuda, one of the two islands that comprise the nation of Antigua & Barbuda, was selected by the Waitt Institute to be the first site to participate in a holistic ocean management plan known as the Blue Halo project. Blue Halo Barbuda is a partnership between the Government of Antigua & Barbuda, Waitt Institute, and many collaborators committed to developing and implementing comprehensive, science-based, community-driven solutions for sustainable ocean management. This expedition followed an initial baseline assessment conducted by a larger scientific party in 2014 to quantify Barbuda’s costal habitats, with an emphasis on its coral reefs. The scientific team included partners from Antigua & Barbuda Fisheries Division, Florida International University, and the Waitt Institute. 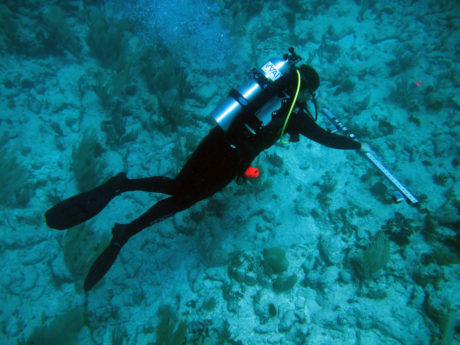 The expediition goal was to conduct baseline photomosaic surveys in the Palastar Marine Sanctuary on the southern coast of Barbuda. The dive team used the established photomosaic protocol and equipment to collect large area images of the benthos, while simultaneously collecting imagery using a newly developed GoPro mosaic setup. Nathaniel was testing the feasibility of using a reduced version of the photomosaic setup, also known as the GoPro mosaic. The goals of the GoPro mosaic were two-fold: to reduce the cost of mosaic equipment and to facilitate the mosaic rendering process by developing a less complex protocol. 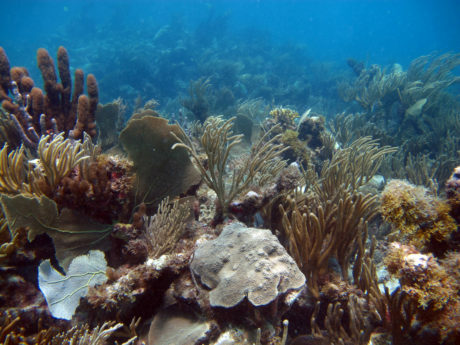 In total, the team collected eight photomosaics within the Palastar Marine Sanctuary in southern Barbuda.